We should all be thankful that retailing moguls haven’t been able to figure out a way to make International Women’s Day a sales event. In San Diego, a mid-day downtown (7th & B) demonstration heralded the struggles of Immigrant Women around the world, calling out poverty, abuse and exploitation in the janitorial workforce. Today we’ll take a look around the media world to see what is happening with regard to women on March 8, 2016. The acceptance of women as human beings, having human rights and an equal role in society only goes back a couple of centuries in western culture. And changing those attitudes has come from ongoing political struggle. In the United States, the women’s movement paralleled the growth of abolitionist activism. It was also deeply rooted in the struggle to organize workplaces against exploitation. Some say International Women’s Day started as an event organized by the Socialist Party of America honoring the first anniversary of the 1908 strike of the International Ladies’ Garment Workers’ Union. Others say it was organized in remembrance of an 1857 action by garment workers in New York City marched and picketed, demanding improved working conditions, a ten hour day, and equal rights for women. Their ranks were, needless to say, broken up by the police. For much of the 20th Century, the day honoring the struggles of women for equality was linked to the socialist and communist political movements around the world. Leon Trotsky made the claim that International Woman’s Day and meetings and actions triggered the 1917 Russian Revolution. 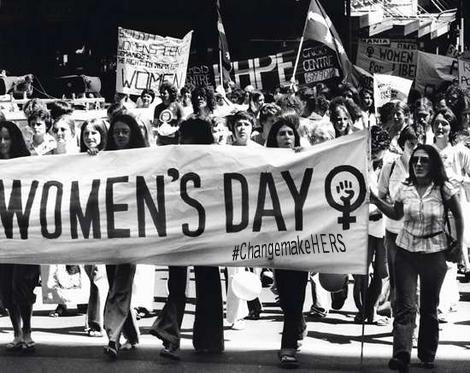 In 1977, the United Nations General Assembly invited member states to proclaim March 8 as the UN Day for women’s rights and world peace. A rising feminist movement in the United States had already adopted the day as a mechanism for organizing and raising consciousness. While many countries still recognize March 8th as a day to recognize the political, economic and social challenges faced by women, others observe the day as an occasion to honor the “specialness” of women. Newsweek ran with a feature asking six women one idea they think would, if carried out, make the world a better place for women. The World Economic Forum ranks 142 countries on women’s equality on a scale of 0 (no equality) to 1 (full equality). The highest score of all is Iceland, clocking in at 0.881. Definitely not bad, but not fully equal either. The United States is 28th, with a score of 0.740 — a pretty big drop from its 20th place finish in 2014. Dead last is Yemen, at 0.484. The score is based on many factors, like how many women participate in the workforce and how well they’re paid compared to men; health and educational outcomes; and political empowerment and representation in government. The American Association of University Women (AAUW) has a terrific web site and report examining the aspects of the Gender Pay Gap. Suffice it say the situation is more complicated and in many ways (especially for women of color) worse than imagined by the public. Contemporary efforts targeting women by domestic reactionaries are focused on state control of their reproductive health. The very same people lamenting Big Government are working overtime to harness state power in their cause. Cloaked behind their agenda on access to abortion is their ultimate goal: limiting birth control. And if you dig down far enough, this control is really about keeping women in their place. In addition to the faux Planned Parenthood scandal, nearly 300 hundred restrictions on access to abortion have been imposed by states over the past five years. The Oklahoma legislature is considering a bill to make getting an abortion classified as first-degree murder. Beyond the front lines of the attacks on women’s health, there is the reality that injustice ion all its forms is rarely gender-neutral. In Flint, widespread lead poisoning is devastating the community. The effects of lead poisoning, like Zika, can be passed down from mother to baby, with increased rates of gestational hypertension, low birth weight, and preterm deliveries, as well as effects on fetal neurological development. Just like the women affected by the Zika virus, those affected by lead poisoning, especially in Flint, are more likely to be living in poverty. Flint, a city where over half of its residents are African-American, has 40 percent of its people living below the poverty line. In Flint and across the United States, African American children are five times more likely to be poisoned than white children. And to compound the challenges the mothers of Flint are facing, Michigan’s funding for pregnancy prevention is entirely has faced dramatic cuts, dropping from more than $7 million in 2001 to just over $600,000 in 2012. The Zika virus and the lead poisoning of Flint make it clear that environmental injustice isn’t gender-neutral and for women, when climate catastrophes, pollution, and public health crises hit, they hit hard. Reproductive justice isn’t only the right to choose to have children, but the right to have children in safe and healthy environments. The women of Flint and Latin America with little to no access to contraception and surrounded by unsafe environments have lost both sides of reproductive rights: the right to choose when to parent, and the right to parent in a safe and healthy environment. Without access to voluntary contraception, these women physically aren’t able to stop the effects of this devastating environmental injustice.